Drawing on the mega-success of Christopher Hart's Manga Mania series, Manga Mania Universe combines curated content from each previous Manga Mania book (Girl Power!, Romance, and Shonen) into one giant volume. 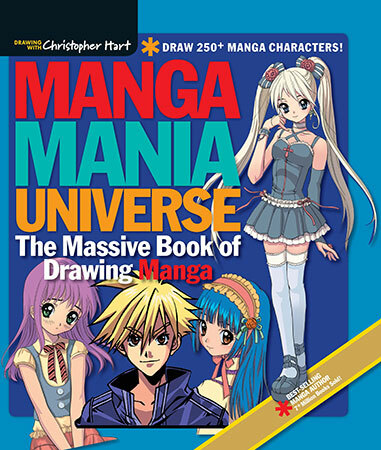 Manga fans will enjoy having such a wide variety of how-to-draw manga instruction in one convenient book. The dynamic artwork and first-rate instruction that has made this series a success is fully apparent in this version, which showcases the best in drawing manga girls, romantic characters and scenes, and manga action and adventure. The thickness of this volume, at this price point, will be a definite draw for the manga-drawing set as well. Flexibound • 9.25 x 10.25"